There are many creative ways to reuse old items to build something unique and functional. Wine barrels that are no longer serving any purpose are a great resource. 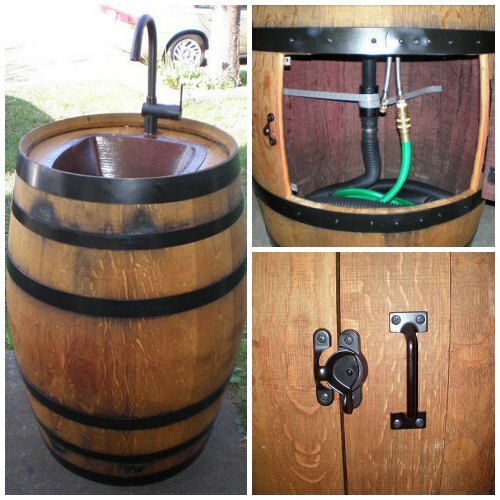 One promising idea involves using an old wine barrel and transforming it into an outdoor sink. Adding a rustic-looking item is a great way to decorate a space and the unique shape of a wine barrel can be a perfect addition to an outside space. When it comes to usability, an outdoor sink has many uses including at an outdoor patio, outside bar, or any environment that could benefit from such a useful and attractive item. One important thing to realize about an outdoor sink is that this particular fixture is not connected to the plumbing for your home. A garden hose is used to supply the water. Of course, this means that an outdoor sink might not be the best idea for drinking water. The use of an outdoor sink is a great option when water is needed for washing hands, washing fish that have been cleaned, and many other uses. One important factor to keep in mind for the project is the drain for the sink. This is the one element of your sink that cannot be overlooked. You do not want any leaks in your sink or find that the drain is insufficient. All the materials for your outdoor sink can be found at a home improvement store. The barrel might be the hardest item to find if no one has an old barrel in your area. One of the best first steps is to determine where to place your sink before beginning the project. Placement is an important part of the process as an outdoor sink should be close to a faucet so that the sink will have a sufficient supply of water.